On a late Sunday afternoon, I find myself looking for something to eat out. Just ended a five mile run through the amazing Hampstead Heath. That’s the ancient London heath, covering 320 hectares, so my run barely scratched a few pathways. Nevertheless it definitely burned my reserves and got me craving for some local replenishments. I won’t land far, as the Kentish Town road offers a myriad of eat-out options. Most of them are fast, food that’s faster than me running, so I steer away. I’m also thinking about the fact that yesterday evening I overdid it on the meat eating, so now I’m going to counterbalance it with some vegetarian. 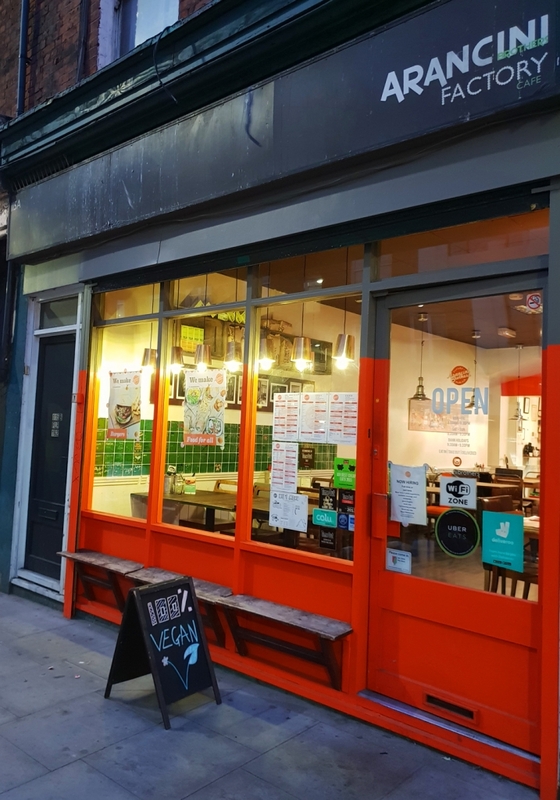 I make my stop in the original Arancini Brothers location in Kentish Town. It’s now expanded to multiple locations across the city, but this one they mention to be their first brick and mortar space. When using a map you will find it as Arancini Factory Cafe, but don’t get fooled by the name, it’s much more than a cafe. 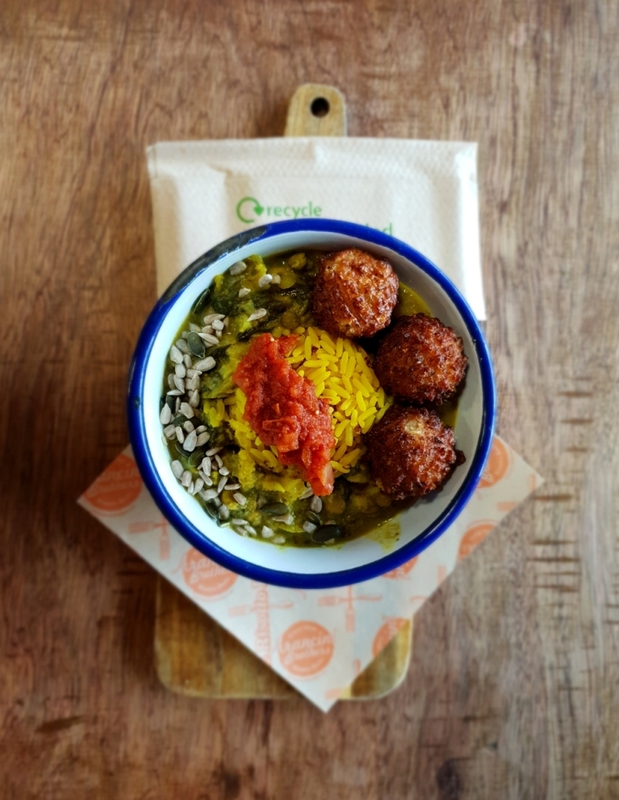 It’s a 100% plant based quality food kitchen, with a signature dish of risotto balls aka ‘arancini’. There’s a plentiful menu to choose from, all options ending in (V) from vegetarian. As I’m lucky enough to find myself between lunch and dinner menus, I order a starter from the lunch and a main from the latter. Risotto balls – spice, risotto, read on for the original recipe. I start with hunger and a stew. And as anyone who tried to cook any kind of stew knows, it’s hard to explain it by individual ingredients. Like one bearded hipster put it a long time ago: ‘The whole is more than the sum of its parts’ (Aristotle). It’s one tasty combination of all-plant flavours, giving a sense of well cooked meal. It feels complete, with many ingredients that give it a well balanced nutrient distribution. The rice with turmeric is a base, well complemented in each bite by the spinach, the butternut or the chickpeas. All in quantities so that I get to enjoy the taste, none of them that would get me bored of the same. On top of the stew there are the kitchen’s signature risotto balls, and I do taste them with curiosity. I wouldn’t want to murder their recipe so I will quote Dave&Dave, the owners, on this “Big grains of rice are mixed through slow cooked onion, garlic and herbs, vegetable stock is added to make a firm, delicious risotto. Then we mix through flavours like parsley and lemons. This is hand rolled into little balls, coated in rice flour then fried and enjoyed.” Definitely enjoyed. The fact that the stew is a vegetarian dish is well felt, it does not try to do any tricks or mimics that others do to disguise it. I personally appreciate it, even the colours are an original veggie green and yellow. It’s gone before I know it and my stomach starts working the process towards those proteins from the spinach and chickpeas, plenty of carbs from the rice and a little bit of unsaturated fat from the seeds. The veggie burger is mainstream in London nowadays but we do tend to forget that wasn’t the case not long ago. It took a lot of creativity and customer convincing to try out these amazing vegetarian alternatives. The burger in front of me does have the name of a sausage, but it’s 100% plant based. This time the middle of the burger does imitate meat products, in the sense that they are of similar texture and send you thinking of the fatty contents of a meat burger. Sure, the taste is different, quite unique I may add, and it should be so. The buns are organic, but they are white four bread that you would expect from a burger, plus a bit toasted. These are lined with a bit of mayo that blends well with melted cheese. Next is Sriracha, and if you were wondering, it’s a hot sauce based on chilli peppers, distilled vinegar and garlic. The Sriracha spices up the CHorizo and mushroom patty, which (pun intended) are the meaty part of the burger. This is the protein consistent part of the dish, because the CHoriso is a mix based on soy protein, along with the protein rich mushroom. To finish up with some freshness, there’s tomato and rocket salad on top of the base bun. 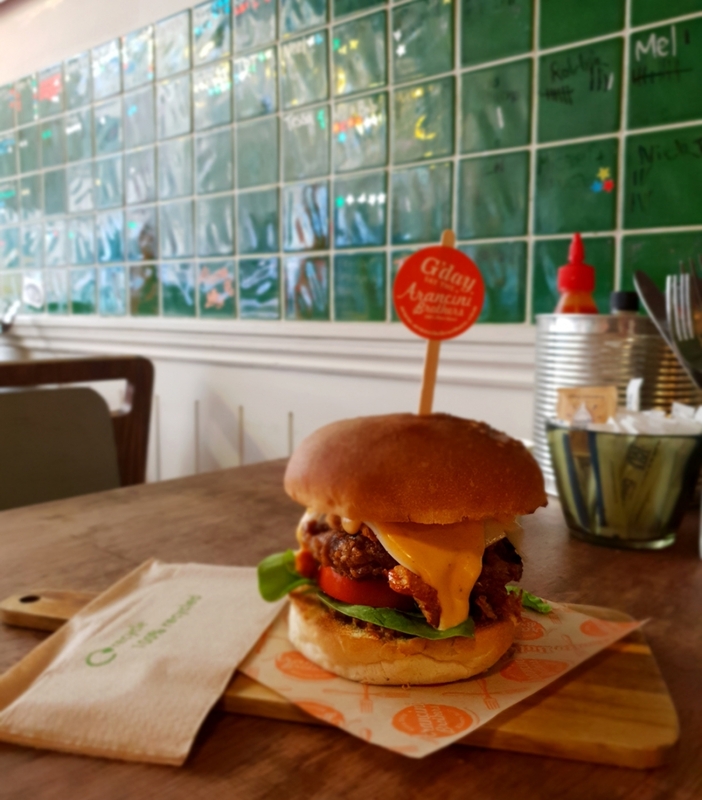 The burger really satisfied my satiety, made my taste buds happy, and all meat free – mission accomplished. I don’t know if there’s anything like a vegetarian guilty pleasure but this sure felt like it. I loved the unpretentious, local feel of the place, with green tiles signed by visitors and an ad-wall filled with announcements spanning from art galleries to Tai Chi classes, even yoga for children – is that a thing now? Though I went on a weekend, Arancini Brothers does seem like a place where you can go to any-day and make it a regular.